Talk about a love/hate relationship! These Individual Chocolate Souffles are everywhere and have been for ages. And depending on where you get them, and how well they’re cooked, they’re sometimes, called Molten Cakes, Lava Cakes or Souffles, and sometimes I think I’m just over them. Yet one bite and I fall back in love. One thing’s for sure, they’re perfect for Valentine’s day. And Individual Chocolate Souffles are absolutely delish. There does seem to be a problem and that is that so many recipes just fall short of our expectations of a molten center spilling out across the plate at that first bite. And with this recipe for Individual Chocolate Souffles, in my experience, it can be touch and go. 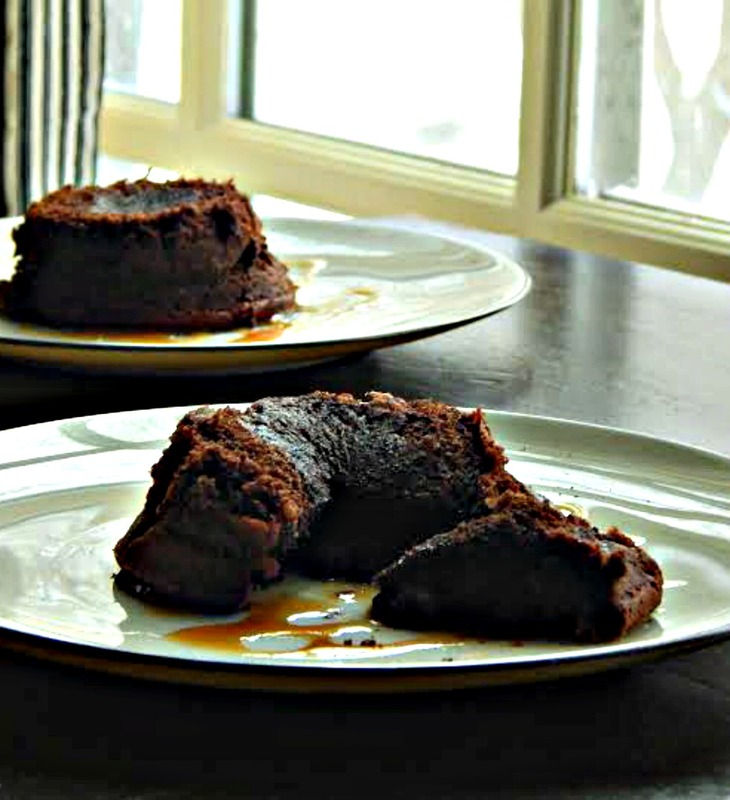 If they’re underbaked, you might get the oozy batter flowing out, but for an individual little cake that oozes real chocolate, you’ll have the best results by making my Individual Molten Lava Cakes. They’re a beautiful thing…but they’re not a souffle like this recipe. This recipe for Individual Chocolate Souffles was developed by Cook’s Illustrated (gotta love those guys!) and is really truly a souffle, light and airy with a deeper, richer, softer, gooey chocolate center. Absolute perfection, in my opinion. These are a very quick dessert using common ingredients. It takes about 20 minutes to make and only a few to bake. Pop them in the oven during the meal and they’ll be done by the time you finish. The recipe is super easy, always turns out well and works reliably. I’ve tried umpteen recipes for Individual Chocolate Souffles and that’s not always the case! The recipe makes eight and can be made ahead or frozen. Perfect for small families, portion control or for a party. And since they can be made ahead and frozen, you’ll look like a hero when you invite someone over last-minute and when it’s time for dessert you pull out a tray of Chocolate Souffles! The downside of that, though, is you’ll probably tie up every custard cup you have (well, I only have eight of them that match and a few odds and ends) and it’s so super easy to bake off one or a few, you may always be at your little freezer stash of souffles. Or maybe that’s just me! The recipe for Individual Chocolate Souffles really is easy, especially if you use the microwave to melt the chocolate and butter. Just be careful with the microwave and make sure to stop it and stir after a minute and then every 30 seconds, melting only just enough to stir together the butter and the chocolate. You don’t want to overheat and have to let it cool and if it’s too hot, you’ll risk cooking the eggs. Do be sure to beat and beat that egg/sugar mixture – it’s the key to really getting this recipe right and pull out the stand mixer for faster results. I’ve also found that if you’re generous with the butter as the recipe states, these souffles are going to rise higher – they’ll have more cocoa to cling to and climb up as they bake. If you are hoping for a melty, oozy, center, you’re probably going to have to figure out an exact timing for your oven and the souffle cups your using. Maybe experiment a time or two. Then write it down so that you have the timing next time. Honestly, though, I do think the Individual Molten Lava Cakes are your better bet – they have a chocolate ganache ball inside that melts and oozes out. The chocolate in this recipe is a huge variable. The best are pricey and wonderful! I’ve used nearly every kind of chocolate over the years, and this time used a bar of chocolate from Aldi – just called “dark chocolate” and was surprised how good it was – I rounded out with a few chocolate chips, just because the bars weren’t quite six ounces. Chocolate chips are a great budget way to go because they go on sale with coupons. Buy butter on sale, especially during the Winter Holiday season or pre-Easter sales. Freeze it where it will keep fine for months and do really stock up at a low. Butter is also a lot less at both Costco and Aldi and the Aldi prices rival the best grocery store sale prices. Eggs can also be bought during holiday sales and keep well for several weeks. Refrigerate right away and never store in the door; eggs keep best in a colder part of the refrigerator, in their own box. (Then put your partially used vegetables in the door where you’ll see them and remember they need to be used ASAP – the half a bell pepper or onion, etc.) In doubt about an egg? It’s very rare to find a spoiled egg but if your egg floats in water, it’s old and has probably thickened a lot from air exchange. See my post on over 75 Ways to Use Egg Whites for how to handle the extra white you’ll have from this recipe. Very generously butter the eight 6-ounce ramekins. Dust with cocoa powder, turning the ramekin to distribute, then turn over and gently tap out the excess. Tapping from the first ramekin into the second, then into the third, etc. conserves the amount of cocoa needed. Melt butter and chocolate in the top portion of a double boiler, stirring until smooth or in the microwave for about a minute, stirring, then heating for 30-second increments, stirring after each until melted. Remove from heat or microwave and stir together until smooth. Beat the eggs and yolk along with the sugar and alcohol of choice with a mixer until the color is pale yellow, the volume nearly tripled and it reaches the ribbon stage – the mixture will drop from the beaters in a heavy thick ribbon. This will probably take about eight to 10 minutes with a hand-held and four to five with a standing mixer. Drizzle the chocolate mixture over the egg mixture. Sprinkle flour over the top and gently fold together until batter is completely mixed. Pour or spoon into prepared ramekins. At this stage, the souffles may baked immediately, refrigerated for up to 8 hours, keeping in mind they’ll need to come back to room temperature for about 30 minutes before baking, or they may be frozen, tightly wrapped in plastic wrap and then foil, where they’ll keep for a month, and may be baked from the frozen state. To bake, preheat oven to 400 degrees. Place ramekins on a tray or cookie sheet and place in oven. Bake for about 10 to 12 minutes; the cakes will rise over the rims. They’re done when they have a thin crust and the center jiggles when you tap ramekins. If frozen, bake 12 to 14 minutes. Let cakes sit for a minute before running a knife around the edges to loosen the cake. Place a plate upside down over the ramekin and invert. Let sit for a few seconds and the cakes should slide out. Gently tap if not, and if the cake still doesn’t release onto the plate, run a knife around the edge of a ramekin again. Serve immediately with a dusting of cocoa powder or powdered sugar. If desired, raspberries, a raspberry coulis, a drizzle of chocolate or caramel sauce, a custard sauce, whipped cream or ice-cream pair well with this dessert. This entry was posted in Click here for Fabulous Food Posts and tagged Chocolate, Cook's Illustrated, Desserts, Freezes Well, Souffle. Bookmark the permalink. A keeper! A hostess needs this kind of recipe from the freezer. Great photos and description. This is a geat recipe to have. Makes ya look like a genius! I thought you did, too, because I was quite jealous of the amount of ooze you got! I’ve never been able to get that ooze and have them stay together. I’ll put your link up as a related article! I had to do some checking on the comment because I knew I saw it earlier – and thought I had commented on it. It seems wordpress is holding posts with URL’s in the comments as spam, and they wait for approval. I’m guessing this is probably because the urls drive traffic from my site – when people click on them, my site doesn’t stay open, and the viewer leaves. When people click on a gravatar, it opens in a new window, but leaves this site open. I don’t know why some comments with urls come through and others don’t; it’s a mystery. Yummy! Im drooling here looking at the pics. Nice tips too. Thanks! Of course what’s so great about these is you can serve two for valentine’s or maybe four? And then freeze the others for later…. Loved all the tips on cost effective factor here. The recipe itself is a star. Thanks so much! 🙂 I started for my daughter, who is out of state, and always said my recipes were “too expensive.” I realized it’s not the ingredients that were her problem – she left home not knowing how to shop.